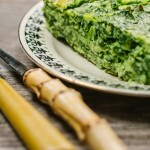 Crustless Spinach and Cheese Pie is a forty minute, perfect for breakfast, lunch or dinner kind of healthy option for the days when you don’t know what to make. I love pies but they take a considerable amount of time to prep. Even the ones you layer as uncomplicated as they are, still require a certain amount of care. So, when a pie with a soft, chewy consistency and not too much expert work involved came along, I jumped on the recipe so I could share it with you. The closest I can describe it to is quiche. Smooth, soft, tender, tasty. You think you’ll eat the entire pan, and not even a quarter way in you find yourself completely satisfied. 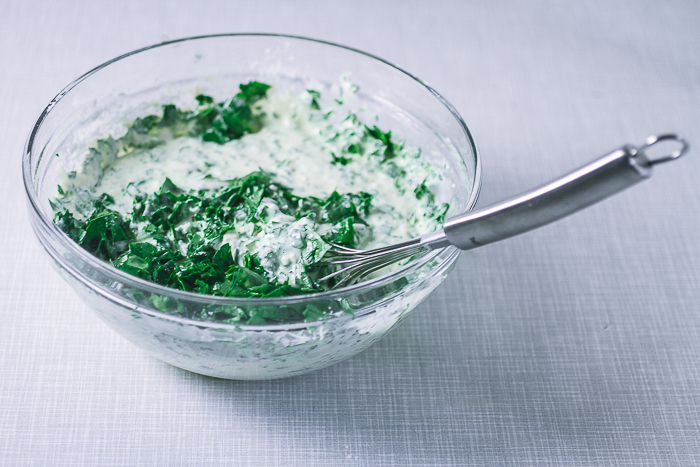 But before we get into the pie itself, let me boast about this superfood called spinach. 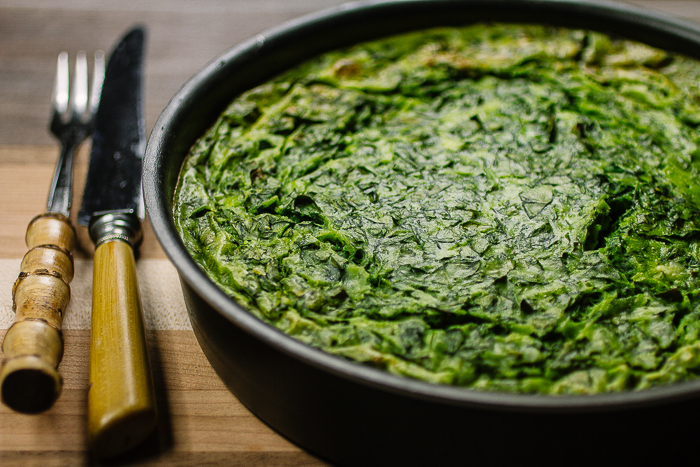 Not only is spinach a source of several vitamins and minerals (including great amounts of iron), but the fiber in spinach regulates blood sugar levels and helps eliminate toxins. I can’t say enough about it, but I do urge you to read this background article on spinach to see exactly which benefits you’re getting from consuming it. 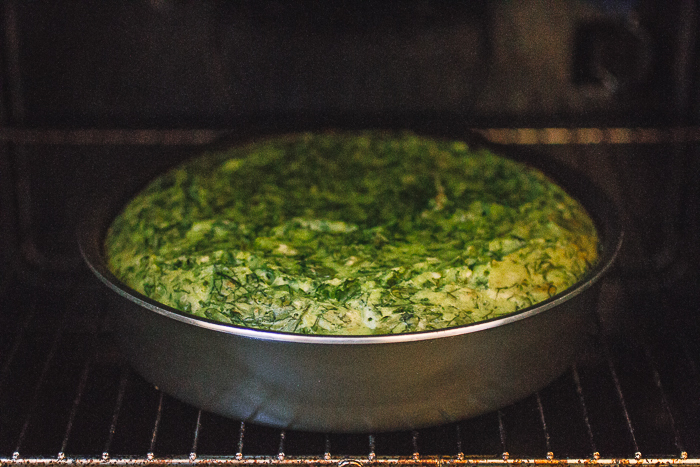 Going back to the recipe, to make this crustless spinach and egg pie, you’ll mix some eggs with cheese and sour cream, add stripes of spinach that you previously cut (and this is the only “expert” thing required, to really chop down that spinach to the thinnest stripes you can), mix and bake. And that’s it! The pie is great for breakfast, lunch or dinner. You can pair it with eggs, or chicken. A versatile option for those days when you just want to throw something together and have it magically come out well. 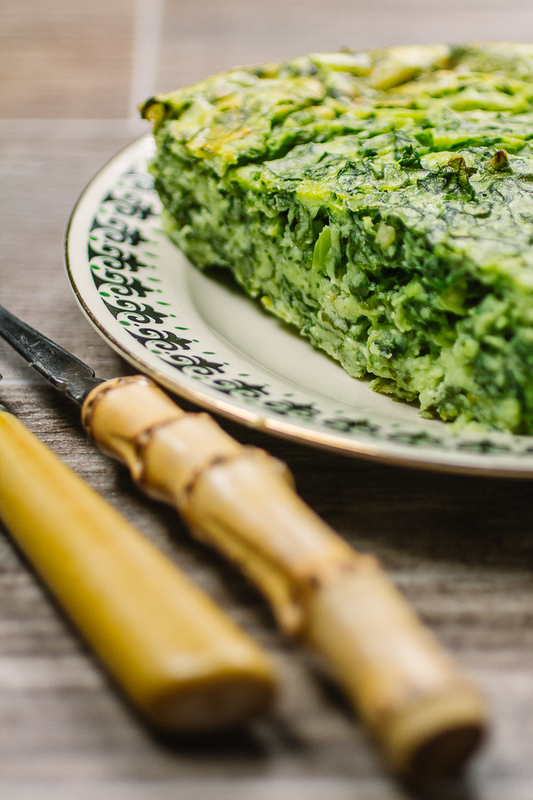 If you liked this recipe, you may also like sauteed spinach or spinach phyllo pie! Beat eggs in a larger bowl. 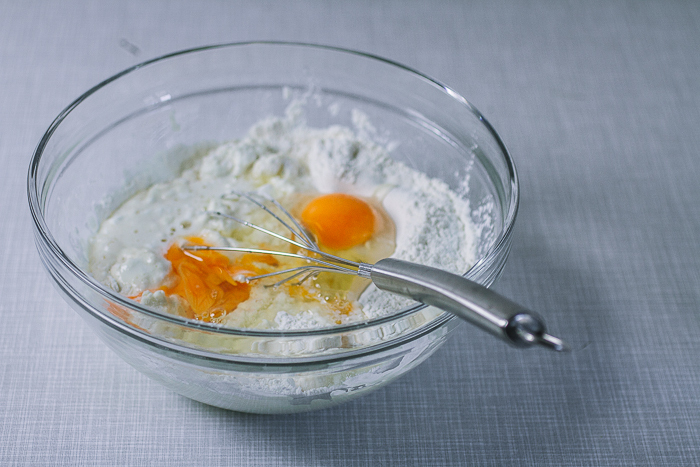 Add milk, salt and baking soda and continue whisking. Add cheese and sour cream, and flour, and stir until well integrated. Heat oven to 390F. Wash spinach and cut into very thin strips. Add to the mixture and mix thoroughly. Oil a pan (the one used here was 9 inches in diameter) lightly. Transfer the mixture into the pan, distributing it evenly. Place in oven and bake for a total of 30 minutes, turning it halfway. If you prefer a thinner, crispier pie, use a larger baking pan and add a few minutes to the baking time. Hi Aida! I made this today for breakfast and it was a hit with my husband and my in-laws! I followed the recipe as written, except that I only had about a half pound of spinach instead of a pound. I think even with the half-pound of spinach I wouldn’t have added any more in because the wet ingredients barely incorporated the spinach I used. Because my oven tends to run hot, I baked it at 350 F for about 40 min, using a 9 inch pan. I love the recipe 🙂 I live in southern California, it’s always sunny here! Hope you’re doing well too and keeping warm! how much frozen spinach? i have a couple of bags in my freezer i would like to get rid of? Here is an article that talks about fresh versus frozen spinach. It looks like you’ll need about 10oz for the recipe above.